The August 2010 economic update report (pdf, 482kb) from Advantage West Midlands is now available. The report includes headlines and statistics, both national and from the West Midlands, on the state of the economy, inflation, the labour market, house prices, manufacturing, automotive, services sectors, construction, and retail. The updates are published monthly here. By isolating the ‘risk factors’ and certain combinations of ‘risk factors’ associated with a person’s chance of being out of work, new analysis from the West Midlands Observatory can help decision makers get to grips with the complex interplay of issues behind the current high rate of worklessness across the West Midlands. The research is already informing the Department for Work and Pensions in its review of welfare policy, as it provides insights into the major factors influencing a person’s chances of being in or out of work. It shows that these chances can vary greatly according to the individual’s background and personal characteristics. The research demonstrates how combinations of factors such as having no formal qualifications or a long-term health problem or disability, or being a lone parent, affect a person’s chance of being out of work. The pace of economic growth in the West Midlands over the next five years is forecast to be modest. Only 11,000 net new jobs (representing growth of 5% in total employment) are expected to be created between 2010 and 2015. 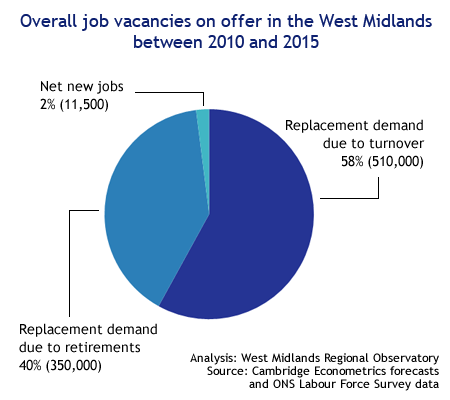 However, the Observatory’s new report The West Midlands economy post recession: key issues and challenges (pdf, 844kb) includes scenarios illustrating the benefits for the West Midlands in terms of new job creation — if action is taken to support fundamental, transformational change. If workforce skill levels in the West Midlands were raised to match the England average, it’s estimated that net increase in employment over the next five years would almost double to around 21,000 jobs. If more businesses in higher value added sectors and clusters were also attracted to the West Midlands, such that their share of GVA matched the England average, the impact would be much more significant with the creation of more than 200,000 net new jobs. High value added activities such as high value added business & professional services (where more than 100,000 net new jobs would be created) and ICT (30,000 net new jobs) are notable beneficiaries. There would also be modest increases in employment levels in engineering (nearly 3,000 net new jobs) and manufacturing (nearly 6,000 net new jobs). An under–representation of higher value added sectors means that the pace of economic growth in the West Midlands over the next 5 years is forecast to be modest. Only 11,000 net new jobs (representing growth of 5% in total employment) are expected to be created between 2010 and 2015. It’s estimated that nearly 510,000 jobs (58% of all job vacancies) will be due to labour turnover and more than 350,000 jobs (40% of all vacancies) will be due to older workers retiring. Text description of this chart available. 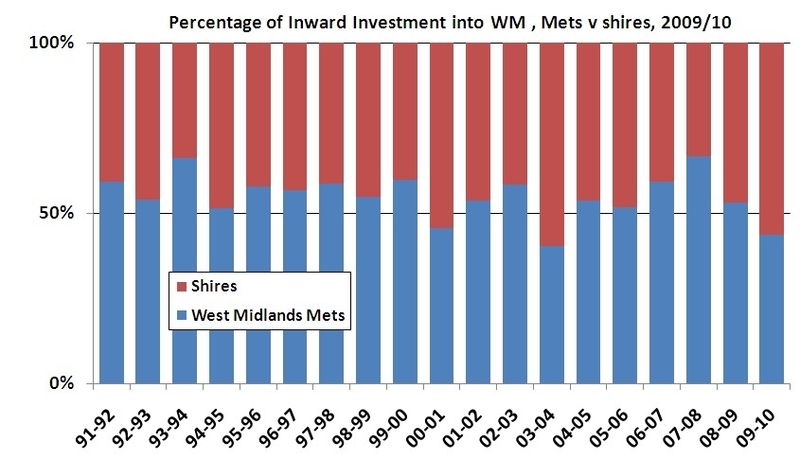 Chart prepared by West Midlands Regional Observatory based on Cambridge Econometrics forecasts and Office for National Statistics Labour Force Survey. In health and social care, meanwhile, nearly 70,000 vacancies are expected to arise. The figure is more than 45,000 in education and more than 30,000 in public administration. Many of the jobs on offer due to retirements are likely to require specific skills, qualifications and experience. Around 90% of these jobs are expected to be filled by people already in employment. A continuing under–representation of higher value added sectors means that the pace of economic growth in the West Midlands over the next five years is forecast to be modest. The Observatory’s new report The West Midlands economy post recession: key issues and challenges (pdf, 844kb) forecasts GVA to grow by just 11% (£9 billion) between 2010–2015. This compares with growth of 15% (£11 billion) between 2000–2007. While the pace of growth is forecast to be strongest in higher value added private sector activities (such as ICT & telecoms and high value added business & professional services), they account for only a limited share of GVA. Growth is expected to be much weaker in sectors that dominate the regional economy such as lower value added, traditional private sector activities and the public sector. Geographically, GVA is forecast to grow most strongly (by some 13% between 2010–2015) in areas identified as those with potential to lead the region’s recovery such as Solihull, Warwick and Stratford-on-Avon. The weakest growth (less than 9% over the period) is expected in areas identified as having long-term issues that may inhibit recovery such as Wolverhampton, Walsall, Stoke-on-Trent and Sandwell. According to recent research by the Observatory, recovery from the recession has been fragile. After rising in the second half of 2009, recruitment activity faltered in the early months of 2010. Geographically, the areas expected to experience the most fragile economic recovery in terms of growth in GVA and jobs are traditional industrial areas, such as the Black Country and Stoke-on-Trent. These areas have historically been dependent on industries such as engineering, manufacturing and construction. Recovery is expected to be strongest in areas clustered in the south and east of the West Midlands, in Solihull and Warwickshire. These areas benefit from a strong presence of high value added knowledge-based industries, good communication links and environmental quality. The pace of economic growth in the West Midlands over the next five years (2010–2015) is forecast to be modest. GVA is forecast to grow by 11% (£9 billion) over the period. This compares with growth of 15% (£11 billion) between 2000–2007.